We have two studio rooms focusing on Barre, Yoga and TRX. Our heated yoga studio specializes in power yoga as well as basic and slow flow classes. We are the only studio in the area offering infrared heat. 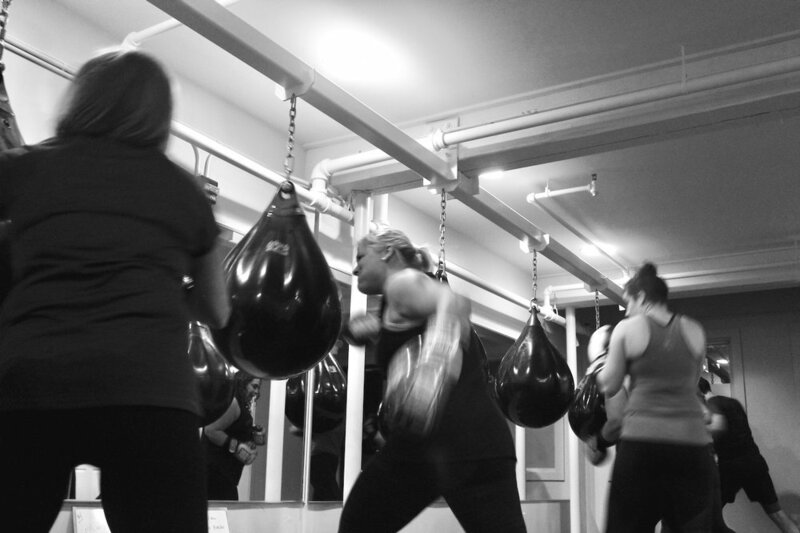 Our new boxing studio, boxcoast™ is right next door featuring fun and challenging boxing based group fitness classes. Drop ins, Multi Class Cards, Monthly Unlimited packages and gift cards available. Our certified instructors are here to help you reach your fitness goals no matter your level. Find your strength mentally and physically. Give us a try and get ready for a studio experience like no other. All fitness and skill levels welcome! Barre is a full body workout that focuses on small, isolated, highly repetitive micro movements that are designed to target and work each muscle group to fatigue, leading to long, defined and toned muscles. BarreCoast is proud to offer power yoga and warm slow classes in one of the area’s only heated yoga studios. TRX Suspension Training leverages gravity and relies solely on the user’s bodyweight to develop strength, balance, flexibility and core stability. Reach your fitness goals, boost your self-confidence, and learn self-defense skills at our brand- new boxing studio, boxcoast™.